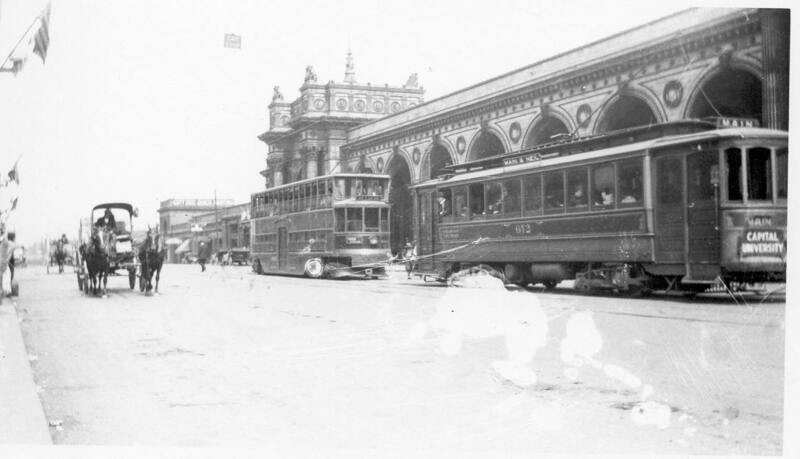 The Columbus Railway, Power & Light Co. had to cope with some difficult restrictions on its streetcar operations. For one, from the beginning of the horsecar in 1863 until the streetcars were abandoned in 1948 they were rarely allowed to charge more than 5 cents for a ride which made strict money management essential. Up until 1926 all streetcars required a two man crew - motorman and conductor. Getting the most efficiency possible from those crews was critical. Another restriction, a majority of CRP&L's lines converged on the Long Street to Broad Street section of High Street causing congestion, especially during peak traffic times that made it almost impossible to keep the system on schedule. The congestion involved too many streetcars in such a short distance and the time it took to unload and load the cars. From 1891, when electric streetcars were introduced, through 1926 when one man streetcars were first purchased, the Company made many changes to improve efficiency. For example, in 1895 they introduced the double truck car increasing the capacity of a closed car from 28 to 40 seats. They introduced the Pay-As-You-Enter (PAYE) cars. Instead of the conductor wandering the car to collect his nickel, he had a fixed station at the back door so customers entered the back of the car and exited the front. Cars were built with large end platforms that could stand 12 passengers for faster loading. The passenger had a place to stand as they paid their fare while the car could move on. This was all designed to help keep the cars moving through the High Street congestion point. Some cars were purchased with multiple unit (MU) control so one motorman could control two coupled cars saving on a crew member and allowing cars to run close together. 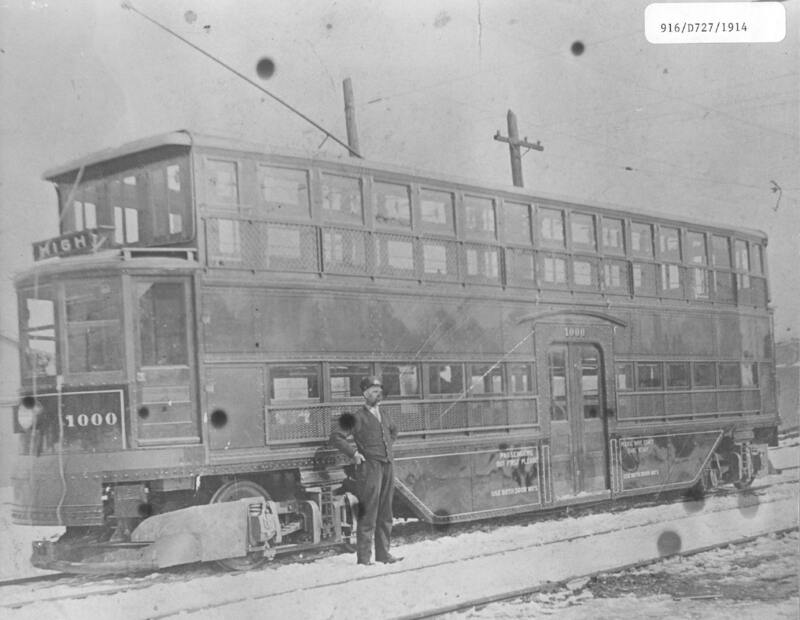 Double-deck car #1000 was another attempt to improve efficiency. It could carry more people with two crew members than any other streetcar. On paper, as you can see in Part II of the double-decker story, it looked like a winner. In practice it wasn't successful and only lasted about a year before it was scrapped. 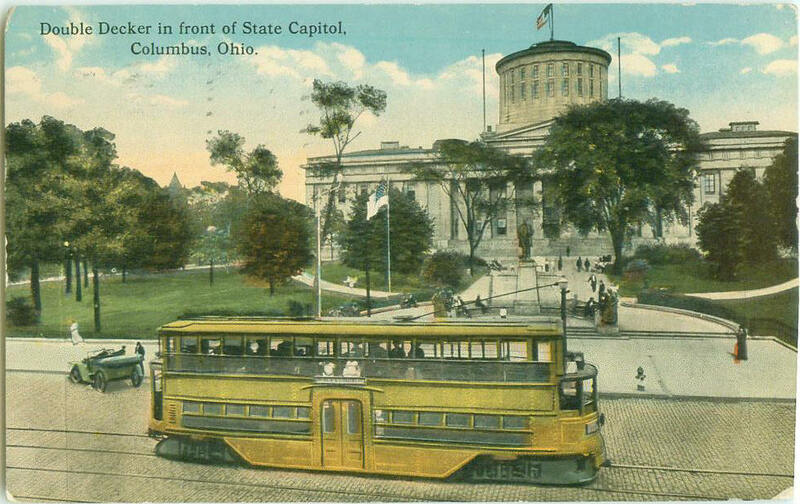 You would think from the old postcards and Columbus retro publications that there was a large fleet of double-deck streetcars in Columbus instead of only #1000 for part of 1914. The main problem was those two middle doors that had to be used for both entering and exiting the car. Picture an elevator full of people meeting a lobby full of people - you get grid lock as people shuffle off and slowly get on the car. That made the High Street congestion point even worse causing more schedule delays. Another problem was #1000 didn't like the tight curves going from one street to another or even turning into the carhouse. This meant it could only run on High Street which didn't have any turnoffs. Another possible problem is #1000 may have been underpowered. Fully loaded it weighted 35 tons and that may have been too much for its two 65 hp motors. Having noted all that, wouldn't it have been grand to be twelve years old touring High Street in the second story of #1000 on a mild 1914 spring day. Since the second story was a convertible car the windows would have been removed making it in effect an open car. As an experiment buying car #1000 was a success because it proved to management that double deck streetcars would not work in Columbus, Ohio.